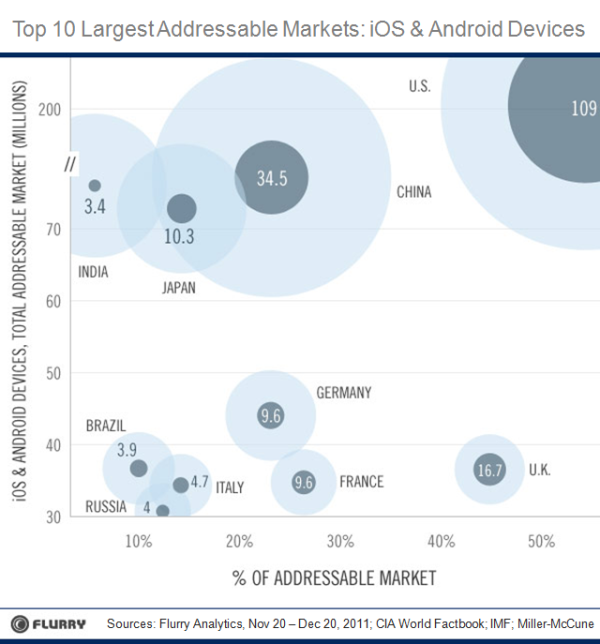 According to Flurry’s data-set of more than 140,000 apps running on smart devices worldwide, Among the top 20 countries, the U.S. still makes up the largest chunk of the world’s active installed base, with 109 million out of 264 million, or 41%. Of note, China and South Korea now hold two of the top five positions, boasting addressable audiences greater than that of more developed countries such as Japan, France and Germany. Also worth noting is that our count of 264 million active units in the market is about half of what Apple and Google publicly state have been activated. The difference is primarily due to old device replacement. Flurry is counting recently used devices versus life-to-date device activations. The TAM ( Total addressable marlet)per country is represented by the larger, light blue circles. The U.S., with the largest light blue circle, has the largest TAM at 200 million. 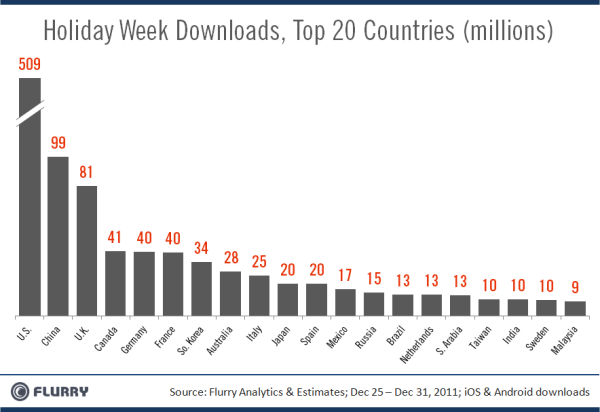 This chart by Flurry's shows the horizontal axis shows percent penetration, which is the active user (iOS or Android device that used an app over the last 30 days) divided by the TAM. 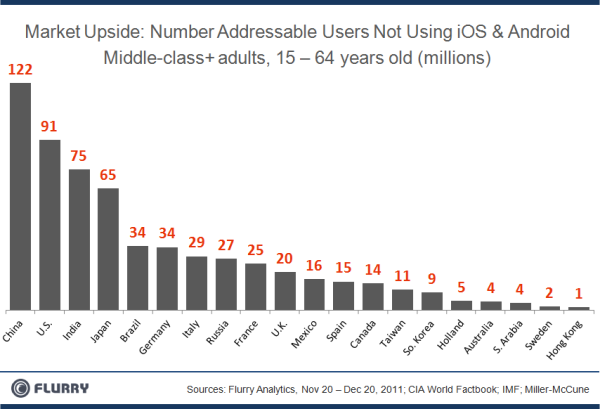 For example, Sweden is the most mature country with 3.2 million of 5 million (66%) addressable consumers already using iOS and Android devices. 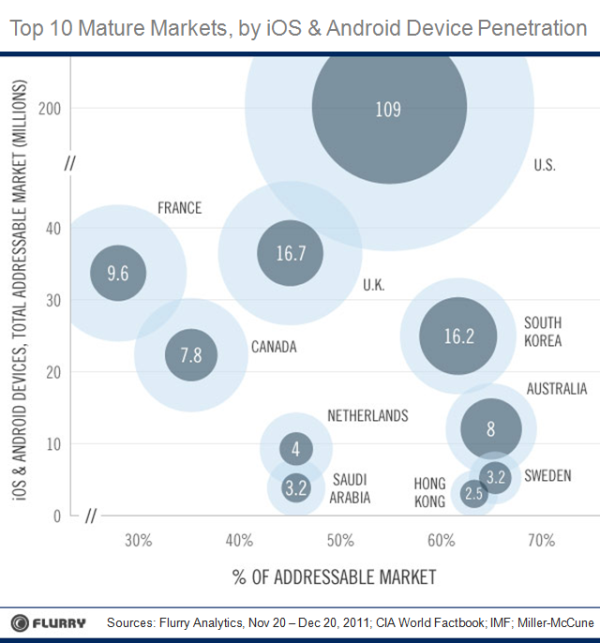 France, which ranks 10th in maturity, has 9.6 million of 34 million (28%) consumers using iOS and Android devices. So, from left to right, penetration increases. And from bottom to top, TAM increases. The U.S. leads the world in installed base because its large, addressable audience has been well penetrated, 91 million of 200 million (55%).